3D Suit full body Motion Capture System utilizes 15 (17) OS3D miniature inertial orientation sensors that measure real-time movements of each major bone segment of the body. From there, with the help of inverse kinematics, the system determines the location of each body joint and applies	that to the skeleton of the avatar. Because inertial sensors rely on earth references of gravity and magnetic field, which exist everywhere, the suit itself is	then	able to operate virtually anywhere and without requiring any	pre-operation setup. With the introduction of	temperature compensation and waterproof housing and cabling, 3DSuit now also offers abilities to work underwater, in rain, in cold or hot weather; almost anywhere a person (or animal) would dare to go! 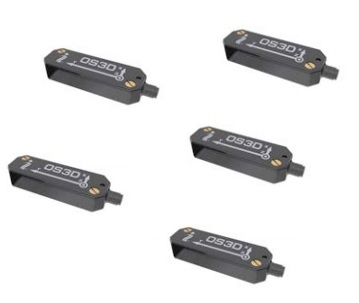 The Inertial Labs OS3D is a multi-purpose miniature 3D orientation sensor designed for use in real-time orientation tracking applications. It includes three types of sensing elements: tri-axial MEMS Gyroscopes, tri-axial MEMS Accelerometers, and tri-axial magneto-resistive Magnetometers. The OS3D also comes equipped with an on board processor and embedded orientation algorithms allowing for direct integration into systems without interfacing a PC.Data from the Gyroscopes, Accelerometers, and Magnetometers, as well as the internal temperature sensor are gathered and processed by the on-board digital signal processor (DSP). The fusion algorithm processes these data and outputs the final orientation solution directly from the sensor. Data of the following types can be requested: raw inertial sensors data and/or quaternion data.Each OS3D module is individually calibrated in a special non-magnetic laboratory where reference accelerations, angular rates, and magnetic fields are applied to the device and measured at constant temperature. Additionally, temperature cycling is performed to obtain temperature calibration parameters for the gyro and accelerometer elements. Once fielded, OS3D is able to be customer calibrated against soft- and hard-iron interference present in the end application. 3DSuit is affordable price, full-body, camera-less, wireless Inertial Motion Capture System. It is a flexible solution that can be used indoors or outdoors finding applications in Motion Capture, Virtual Reality, Movement Science, Military Training, Biomechanics, Rehabilitation, R&D and Education.For more details pleases download product datasheet here. Please complete the enquiry form below for specific information and advice on Motion Capture System.